1. Size and layout of the boat for calculating required system capacity. 2. Access for routing tubes/wires/hoses. 4. Storage space to sacrifice. ■ Below Deck: Cabins where the hull slopes inward toward the keel with minimal port lights and hatches. ■ Mid Deck: Areas on main deck with small or shaded windows. ■ Above Deck: Areas with large glass surfaces and direct sunlight. Multiply the length and width of each cabin to be treated to determine the area in square feet or square meters. It is assumed the boat has an average headroom of about 6.5 ft. (2 m) with an average amount of furniture. If one end of the cabin is narrower than the other, take your measurement in the middle. Step 2: Taking into account the boat’s size and layout, determine the number of self-contained systems or air handlers needed. Find out which cabins or areas will benefit best from a dedicated thermostat control, and which cabins can be served by ducting or a secondary air handler (where the only temperature control is an adjustable grille or fan-speed control). must also be sufficient space in each installation location for servicing and/or removal of the unit. A self-contained unit or air handler must have an open return-air path. However, the return-air grille does not need to be directly in front of the unit. In fact, the system will be less noisy if there is an indirect path for the return air to follow. Never install the unit in the bilge or engine room or where vapors from these areas could reach the unit. A self-contained unit or air handler must be located so the discharge ducting can be routed to a high point in the cabin. Rotate the blower to create the most direct path for routing the discharge duct. Poor airflow may result from a ducting run of over 15 ft. (4.5 m) or a ducting run with many bends. Plan for the shortest possible ducting run while limiting the number of bends. Step 4: Seawater Components. Use one pump of adequate capacity for all air conditioning systems on board. The basic rule is 180 gallons (681.4 liters) per hour (3 GPM/11.4 LPM) of water per ton of air conditioning (one ton = 12,000 BTU/hr). If more than one system shares a common pump, you will also need a pump relay and manifold. The BTU/hr capacity in Table 2 shows recommended seawater flow rates and minimum inlet (through-hull) sizes. Allow for a reduction in capacity of 17% if using a 60Hz pump at 50Hz. Step 5: Determine the proper duct diameter (Ø) and grille sizes for your air conditioning system. 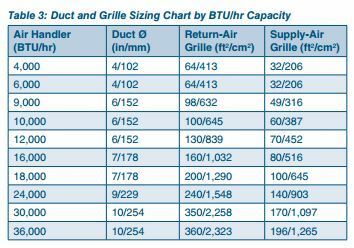 Use Table 3 to find the correct sizes, which are based on the system’s BTU/hr capacity. A complete air conditioning system requires controls, a seawater cooling system, an air-distribution system and electrical connections. There are two types of controls: digital and electro-mechanical switch. ■ Digital: These keypad/displays are part of a microprocessor system with many advanced functions, including automatic fan-speed control, fault display, and a dehumidification program. Decorative bezels can be added to complement the vessel’s interior decor. ■ Mechanical: These manual switches with two or three rotary knobs control the mode of operation, thermostat, and variable fan speed. Reverse-cycle models have automatic changeover between heating and cooling. 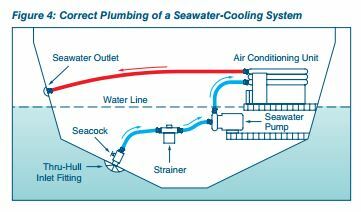 The seawater cooling system brings seawater into and through the system then discharges it overboard. It consists of an inlet through-hull fitting, seacock (water valve), strainer, pump, and overboard discharge fitting, all connected by hose or piping (see Figure 4). If multiple air conditioning units are served by a single seawater pump, then a pump relay and water manifold are required. A centrifugal seawater pump is recommended for efficient, quiet operation and long life. Centrifugal pumps are not self-priming and must be mounted below the water-line (install a self-priming pump for shallow-draft boats). It is important that the seawater plumbing be self-draining, meaning that if the boat is lifted, all water in the piping will drain out. An air conditioning system plumbed this way will have no air locks which could disrupt the flow of seawater. In cooling mode, warm cabin air is drawn into the self-contained unit or air handler through a return-air grille. It is then cooled and blown through flexible insulated duct and back into the cabin through a supplyair grille installed high in the cabin. The supply-air grille should be installed away from the return-air grille to ensure good circulation. 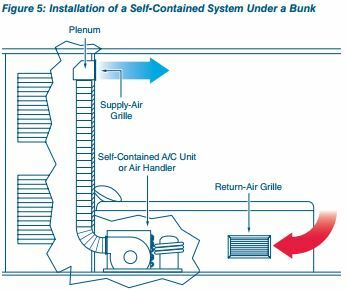 Plenums, or transition boxes, can be installed in the duct to split the air flow into multiple ducts to serve one or more cabins. Marine Air air conditioning systems are available for use with common power supplies throughout the world. In the United States and most of North and South America, the systems are 115 or 230VAC, 60Hz, single phase. In Europe and most of Asia, systems are typically 230VAC, 50Hz, single phase. Running and starting loads of an A/C system are often the largest electrical loads on a boat. It is important that the power supply system is large enough to handle these loads, and is installed properly. Always follow local codes or ABYC codes for proper wiring guidelines. Contact a YACHTAID MARINE if you have any special power requirements. The voltage rating of an air conditioner is a nominal rating. The actual voltage in a given location may be higher or lower by as much as 10% and the system will run fine. Table 4 below shows nominal compressor ratings and the acceptable range of available power. If running your boat’s electrical systems on a generator, make sure the generator can handle the large starting inrush current of the air conditioning compressor. 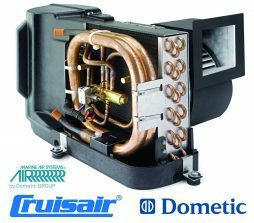 Use of a Dometic SmartStart™ Soft Starter is highly recommended to smooth out the compressor startup power demand and ease strain on the generator. Take the product specification sheets to your generator supplier and ask for their help.